4th October 2014: Performances of Rossini’s massive, astonishingly prescient swan song used to be as rare as hen’s teeth. The last full scale London showing was in 1990 in a terrifyingly old fashioned (even then) production. The sticking point in mounting the piece was always casting the insanely difficult tenor role of Arnold. Written for Adolphe Nourrit, the role is not only huge but is peppered with b flats, b naturals, top Cs and even a sustained C sharp. The role was considered almost uncastable except with huge numbers of disfiguring cuts. Pavarotti recorded the complete role in Italian but, wise man, always refused to attempt the role onstage. 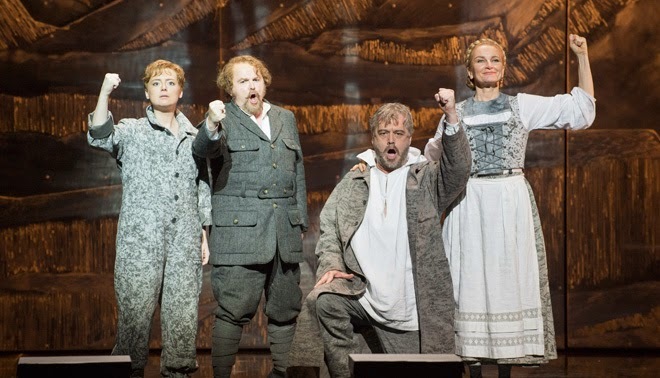 Now, however, with the rich availability of tenors who can tackle the role without fear, we are suddenly assailed by stagings of Tell from all sides. In the last year and a half there have been stagings in Pesaro, Turin, Munich with another to come this season at the Royal Opera House. 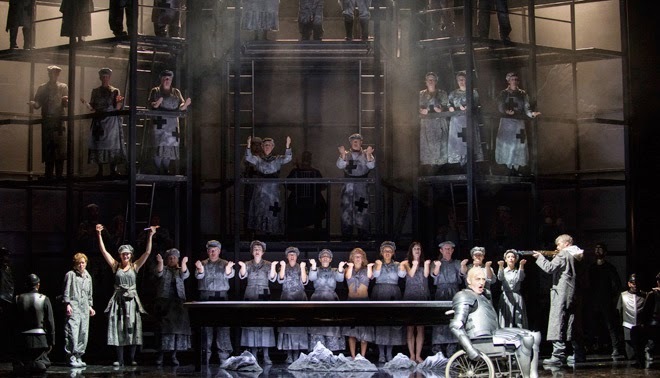 That production will be conducted by Antonio Pappano utilising a similar cast to the recent concert performances but, hopefully, avoiding some of the brutal cuts (most particularly the sublime trio for the three main female voices). 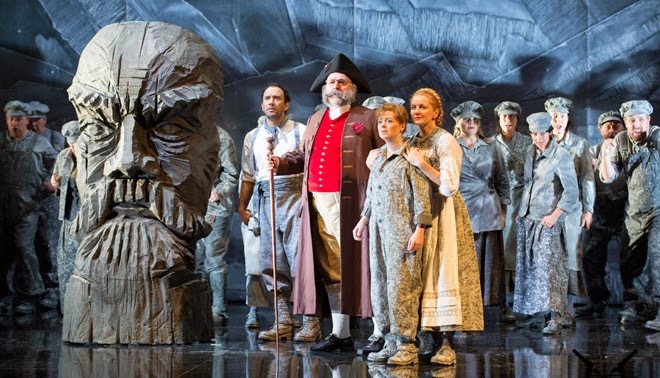 Welsh National Opera retains that section and the overture in its entirety but, inevitably given the restrictions of touring, has cut considerably in other areas. That said, this is a strong performing edition and one that played to the strengths of the company and principals. David Pountney’s production trod an uneven path between perceptive and often revelatory direction of the principals (the contrast between the tight, loving family unit of the Tells and the dysfunctional, borderline abusive Melcthal/Arnold relationship was particularly well defined) with a technical presentation which often strayed close to incompetent. I yield to none in my appreciation of Caspar David Friedrich’s paintings but it was hard to understand the relevance of his grandly austere Polar Sea to the Swiss countryside especially in a work that so often mentions the abundant beauty of the latter. The monochrome version of painting was etched onto three massive perspex screens that, through lighting, could appear either opaque or translucent. Unfortunately this aspect was handled so poorly that one was often embarrassingly aware of singers prior to entry and, even worse, stagehands waiting to perform various technical tasks. The low point was the completely visible silhouette of the Health & Safety monitor throughout the entirety of the second Mathilde/Arnold scene while he patiently waited to unhook the soprano’s safety line! Possibly Poutney was trying to make some point regarding the artificiality of theatre but, if so, it fell painfully flat. Rightly, for a work conceived to take advantage of the full forces of Parisian Opera, there was a strong element of dance throughout the production. This involved many striking images and wildly frenetic choreography (performed with unstinting force by six very hardworking dancers) but the repeated codified movements remained mysterious to me and, I suspect, most of the audience. Fortunately the musical side of proceedings was a good deal more satisfactory: Carlo Rizzi, while not quite attaining the white-heat excitement that Pappano achieved with his Santa Cecilia forces, drew exceptional playing from the WNO orchestra with Rosie Biss’ onstage cello solos a particular highlight. The marvellous WNO chorus, though underused dramatically by Poutney, thrillingly encompassed the complex demands of the score. As already noted any performance of Tell stands or falls on the casting of the principal tenor role and here WNO hit the jackpot. Barry Banks fearlessly sailed through the inordinate demands of the role crowning his portrayal with a superlative “Asile héréditaire” and a spiffing cabaletta with a final sustained top C bringing the house down. He also coped manfully with a costume which seemed to determined to place him as Edward VIII. Gisela Stille projected the dignity and determination of Mathilde, a woman placed in an almost impossible personal and political situation, and her crystalline soprano was well suited to the role. “Sombre fôret” was a moment of sublime calm amongst the dramatic fury but her long solo sections in the second Mathilde/Arnold scene were, if anything, even finer. David Kempster was an appropriately heroic sounding Tell and his big “Reste immobil” aria was beautifully and very movingly phrased. I would have liked a touch more dark cut to the voice in some of the declamatory sections but this was a strong central performance. His son, Jemmy, is a gift of a role and Fflur Wyn seized on all the opportunities offered. Her gorgeous, pure soprano soared like a light in the darkness over the many male dominated scenes. Tell’s wife, Eduige, was luxuriously cast in Leah-Marian Jones who led off the last act female trio in a moment of still beauty. It was a pleasure to see Richard Wiegold (of whom we do not see nearly enough of in London) in not one, but two roles. He was finely defiant as Melcthal (despite a costume that had distinct overtones of Mr. Bumble) and the character’s early demise at the hands of Nicky Spence’s sleazily villainous Rodolphe allowed Wiegold to reappear in Act II as a dignified Walter Furst. His portrayals were so well differentiated that only his extremely characteristic bass tones gave the game away. The other significant bass role is that of the villainous Austrian Governor, Gesler. Unfortunately Clive Bayley, despite possessing a near ideal voice for the role, was asked to play the role as an armour clad, insanely cackling Dr Evil. Only the white fluffy cat was absent from the picture. This miscalculation was doubly frustrating as we know, from previous experience, how good Bayley is a portraying true, scary evil - his terrifying Bluebeard and Claggart are just two examples of what this fine singer is capable of. Overall then, a musical triumph. If only the production had been better realised.